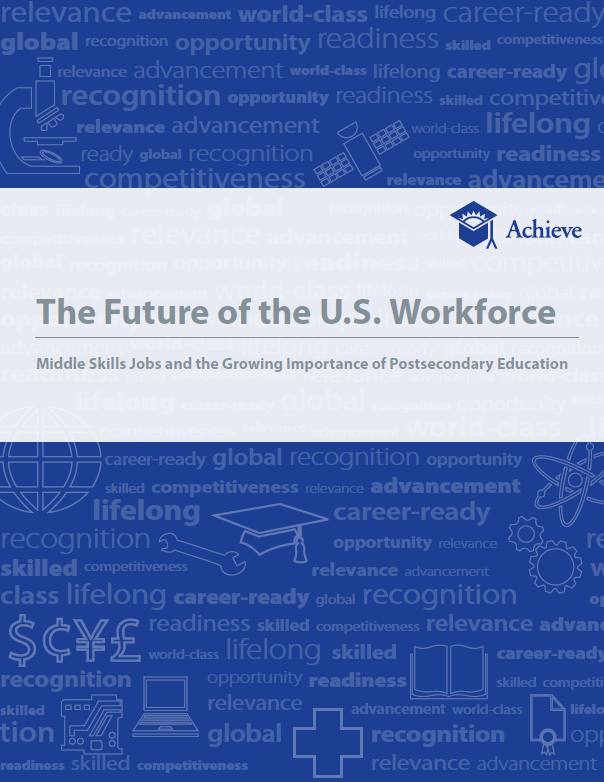 It is increasingly common to hear policymakers, education leaders, and the media refer to "middle skills" jobs, the "skills mismatch," and "career pathways," as we strive to ensure our education system is aligned with our workforce needs. To unpack these terms - and put them in the context of the college- and career-ready agenda - Achieve recently published three reports in our "Future of the U.S. Workforce" series. Below are a summary of the series' findings. About 80% of jobs in the workforce are classified as "middle skills" or "high skills" and it is estimated that thirty of the 46.8 million job openings in 2018 (about 64%) will require some education and training beyond high school. Organizations across all industries are projecting that future jobs at all levels will require more skills, education, and credentials/certifications, with varying degrees of magnitude. A recent survey found that 50% of human resources (HR) professionals anticipate higher education requirements for most jobs and 60% anticipate more jobs with more specific technical requirements in the next 3-5 years. While the fact remains that about a third of current and future jobs require a high school diploma or less, it's critical to remember that these are jobs, not careers, which the data back up in a variety of ways. One way is to simply compare the median incomes for middle skills jobs (about $43,000) to low skills jobs that require a high school diploma ($31,000) or less ($22,000). Only about 5% of low skills jobs were identified as offering opportunities for leadership, advancement, and prestige compared to about half of middle skills jobs and over 90% of high skills jobs. And, when evaluating the skills required across middle and low skills jobs, in all categories but three, middle skills jobs require a higher level of skills - in both traditional "academic" skills (e.g., reading comprehension, mathematics, writing) and traditional "technical" skills (e.g., critical thinking, complex problem solving, monitoring). Many of these skills cannot be fully developed on the job and require additional education and training. Finally, although over 80% of respondents say their organizations offer advancement opportunities for low skills workers, at the same time, over 80% of respondents acknowledge that they hire employees with educational credentials above a high school diploma for jobs that (as posted) require only a high school diploma. While the vast majority of HR professionals report that most employees hold the education credentials required for their current jobs, looking ahead, companies will be requiring more education and training across the board for nearly all positions in all industries. By one estimate, the U.S. will fall short by at least 3 million middle and high skills workers by 2018. In nearly every state, the workforce and labor demands are mismatched, with the mismatch most prevalent between the number and type of middle skills jobs available and the number of workers who can fill them. There are more middle skills jobs available than there are middle skills workers. Part of this is determined by geography, but the lack of aligned education options remains at the heart of this mismatch. Middle skills jobs are those that require some education and training beyond high school, but less than a four-year degree, such as an associate's degree, a certification, completion of an apprenticeship program, or significant on-the-job, employer-provided training. In 2010, nearly 850,000 associate degrees and almost 1 million postsecondary certificates were awarded - a number of which lead to higher-paying jobs than jobs requiring bachelor's degrees. The vast majority of these degrees and credentials are still awarded at institutions of higher education - and commonly two-year colleges. Given the chronically high remediation rates at two-year colleges (which lower the likelihood that students will earn an associate degree from 13.9% to 9.5% and a 1-1.5 year certificate from 22.6% to 13.1%, let alone on time), broadening access to postsecondary programs is not enough without also ensuring that students are prepared for success in those programs with a strong K-12 foundation. The bottom line: Employers are demanding more education and training (and will continue to do so in the future) and jobs that require a high school diploma or less are disappearing. Those low skills jobs that do remain provide lower wages and fewer opportunities for leadership and advancement, and require individuals to gain significant skills (likely through formal and education training) to advance out of them. In other words, middle and high skills careers are the path to the middle class - and a strong K-12 preparation for education and training beyond high school is the path to those careers.